Season's greetings from all of us at The Lerilin Breeze! Lady Moon stirs and rises from her long slumber, and life begins to blossom again in the quaint little village by the sea. It is a friendly place; it is a sleepy place. It is a place where the people smile and wave as you pass them by in the street, where the rhythms of life are steady but never speedy. Where even the very ants are content to stay inside their cozy homes in the hills, with not a care for the wars and grandeur palaces of their northern cousins. Breathe in deep, and take in the invigorating air of... The Lerilin Breeze. Joyous celebrations rang in the new year all night long at The Roasted Barley. The wildly popular half-price creme ale sale attracted townsfolk far and wide—a shame that it lasted but one night! Astonishingly, no bar fights were reported this time around, and we are quite confident that a good time was had by all. By sun-up, all the excitement had died down, and the town quietly returned to normal. In other news, local favorite Nyatha Bark has returned to the scene with a bang. The lovable Maralian terrier slipped her leash on the one hundred and fourteenth day of the Waking Moon in the year of Elara, four hundred and forty-nine, leading owner Geofric on a merry chase all around the village. She was apprehended outside the Ant Hill by a small hunting party that happened to be in the area. It seemed that Nyatha had been on another of her treasure hunts: she is reported to have dug up a chest containing two brand new, single-gem protection rings. The rings were kept by the hunters, and Nyatha was returned safely to Geofric. It would prove to be only the first of Nyatha's adventures this moon (more information to come in the future, as it appears). And while we're on the subject, congratulations are in order for Geofric and Marigold, who are now expecting their fourth child! It remains to be seen whether the happy family will need to once again expand their living space. Some of our readers probably remember the construction of the current house in year four hundred and thirty-nine, when the couple had just given birth to their third child. Ten years later, the house still claims the distinction of being the last construction project ever attempted inside the village. And since there is still a vacancy in the former post of Mayor Palmer—may Elara rest his soul—it is uncertain how such a project would be approved and/or carried out. For those curious, be on the lookout for future editions of the Breeze. We wager that you'll fall in love with our continuous and comprehensive coverage of the events and goings-on that matter to you, dear reader. But before we move on, don't forget: any sightings of loose Maralian terriers should be reported right away to Geofric and Marigold, at the house behind the forge. And if the terrier should start digging a hole in your midst, pay close attention, with your lockpicking sets at the ready. And for the love of all things good and holy, keep any pet rats well out of sight! Now for the next event, we are momentarily forced to set aside levity. For on the one hundred and sixty-first day, a gang of marauding brigands was spotted dangerously close to the village, just southwest of the Circle of Friends guild hall. A pair of hunters came swiftly to the scene, having been alerted to the brigands' presence by a concerned worker ant. The hunters eliminated the brigands and destroyed the campsite, finding a silver long sword and a long bow of speed among the spoils. Despite its alarming nature, we currently believe the event to be an isolated incident. For one thing, follow-up searches failed to uncover anything else out of the ordinary. For another thing, the brigands were not wearing any badges, and so their presence is likely unrelated to the recent revival of Black Hand activity. In fact, the last reported sighting of brigands on the continent dates back to the Fighting Moon, and only then at the faraway hall of the Red Battalion. All villagers are advised to remain calm, yet always vigilant, particularly as the moon begins to grow red with blood. Try as we might, we cannot deny it: the many atrocities inflicted on our village in the early part of this decade will remain a painful memory for a long time to come. We simply cannot afford any more tragedies. But tremble not, dear reader. We are well past any form of threat from the Blood Crusade brigands, the Bloodfang, the Blood Cult, and anyone else who dares affix the word "blood" to the front of their name. And should any of them show their cowardly faces again in our midst, they will find that we are not so easily cowed—indeed, I heard once from a learned man, that Lerilin is sometimes called the cradle of heroes. Assuredly I say to you: any who attempt to do us wrong, will find out exactly why it is so! Thankfully, the remainder of the waning moon unfolded largely without incident. As we go to print, however, rumors are beginning to surface of a freak snail infestation just outside town. We have no further information at this early juncture, and are attempting to reach the guards for an official statement. Perhaps Janister's fish stew experiments have gone horribly wrong again, or perhaps one of our fishermen had a leaky delivery. As always, only time will tell! We now present to you a very special gift and message from our friends at The Friendly Turtle Inn. First-time guests: please enjoy our deluxe accommodations at a thirty-percent discounted rate, for the length of your entire stay (offer value not to exceed period of two hundred and fifty days, or the completion of ten moon phases—whichever comes first). Unparalleled service in a calm, rustic setting. 100% genuine harpie feather bedding. Come on down, show this voucher to Tamyr, and book a room today! Note from the editor: the positions and viewpoints of our partners in the advertisement segment do not necessarily equate to those of the Lerilin Breeze or any of its editors (though we must say, we do rather enjoy the aroma of roses that lingers in the foyer). And that's all we have for you today! We look forward to serving you even more fully in the future, with our renewed commitment to community engagement initiatives just getting underway. So much more, we have in store. But until next time, dear reader: have courage, and press on mightily! It has oft been said that a mighty flame followeth a tiny spark. We cannot help but think of this as we reflect back on the tidings of this long and blood-speckled moon cycle, and as we reflect (quite shamefully) over the fact that we failed to recognize the tiny spark that ignited the flames. And these flames, to put it plainly, may be represented by the latest scourge of Black Hand barbarity, with their undead fiery mages and magma-pulsing behemoths, as described in our digest below. And so we humbly apologize for overlooking, in the last issue, a crucial detail that should've clued us in to the firestorm to come. In that issue, we suggested that the brigand incident on the one hundred and sixty-first day was unconnected to the ongoing Black Hand conflict. We also mentioned that a pair of rare weapons had been found on the scene: a bow of speed and a silver long sword. What we did not mention, is that this same pair of items has been found multiple times before, at the military camps of the villainous Black Hand agent known simply as Fyod. You may think it a small detail, yes, but it was one that suggested a much bigger connection—to those attentive enough to notice. Here at the Lerilin Breeze, we pride ourselves on adding valuable analysis and insight to the information market, and it pains us to know that we did not rise to the occasion in this instance. But so committed are we to making it up to you, dear readers, that we have included a very special offering in this issue, at our very affordable, usual price. But to say anymore would spoil the surprise. So as always: breathe in deep, and take in the invigorating air of The Lerilin Breeze! The unseasonably warm spring—so hot that one would think we were in the miserable throes of the Red Moon—was marked with a frenzy of activity. As mentioned above, the whole town was in uproar on the tenth day of the nascent Growing Moon in the year of Elara, four hundred and forty-nine, when a rather significant fire broke out a mere stone's throw away, to the southwest of town. At the inferno's centre, was a fortress full of hell mages and magma golems and goddess-knows-what-else. This would prove to be only the first of a series of fortresses that have sprung up all across Oberin, and it doesn't look like we are out of the woods just yet. In each of these fortresses, the bravest of Oberin's defenders have found an overwhelming amount of evidence that point to the druid Fyod's involvement. Internal Black Hand communications found on site suggest that Fyod was to receive the hell mages in a shipment, which was being transported by a supplier whose identity is not yet known. We have yet to determine what conclusions, if any, can be drawn from the rest of the recovered Black Hand paraphernalia. The collection is reported to include a stockpile of explosive dust, a large sack of dragon teeth, grandmaster's black plate armour, a ring of greater heal, and a short bow of power. One can only conjecture on the intended function of the explosive dust, but by the grace of the goddess, we can rest assured in the knowledge that our village's defenders are strong enough, and numerous enough, to withstand the fearsome tide of a trio of hell mages (goddess forbid we ever face a quartet or quintet). The other main thread that has become a topic of daily conversation in this past moon is the thrilling case of the Sheep Murderer. Very early on in the Growing Moon, Mr. Lance Waltham of the Andris conglomerate, Waltham's World of Wool, put up posters all over the bank, demanding the head of the person responsible for the assault on his Lerilin pasture. Other eyewitness accounts say that the Lerilin flock was murdered en masse, all of them brutally poisoned. The gruesome nature of this incident quickly obscured any concern over the brigands that had apparently been hired to protect the flock—a separate matter which is still under investigation. But as the moon waxed and waned, the mysterious murderer continued to leave a trail of crime in their wake, murdering sheep here, poisoning sheep there. And then in a stunning turn of events, news leaks from Andris revealed that there were in fact two Sheep Murderers at large, both of them wizards. Rumors suggest that the two might be working together in a concerted effort to outwit the authorities, but due to the ongoing nature of the conflict, we cannot yet guarantee this claim's accuracy. The authorities have not released the names of the criminals, and so we regrettably must wait until next time to provide you with all those important details. Before we move on, however, we would like to provide clarification on a related matter. Contrary to a rather persistent rumor that has been circulating, Mr. Waltham is not offering a one-hundred billion gold piece reward for information on the criminals—nor any reward for that matter. This rather impossible number is actually the amount that Waltham seeks in damages. Our political experts are uncertain how the Andrisian Senate will react, given the recent shift in the balance of power resulting from the election of left-of-centre Senator Jan Varouf, in year four-hundred and forty-eight. But meanwhile, the hunt goes on. Waltham has expanded his search as far north as Mirith, but to date he does not appear to have been successful—we have attempted to reach out for a statement. With all those concerns out of the way, then, we are pleased to close the section by providing you with the updates promised in the last issue, on some of the lighter affairs in our quaint little town. To begin, the late-moon snail infestation that we mentioned last time was, in fact, spawned by an abundance of rotting fish. We gather that some fishing vessel had capsized not far offshore, causing heaps of dead trout to be scattered all over the coastline. This in turn attracted an army of hungry snails, which had to be put down in the interests of public health and safety. And then on the subject of local treasure-hunting: we have not been able to confirm any of the rumors surrounding the latest exploits of the lovely Nyatha Bark, but we can safely assume that this is not the last we have heard from her. Mr. Geofric is perhaps grateful that the Maralian terrier has not escaped her leash, for once. Certainly we all deserve a little break from the madness! And now, as promised! We have gone out of our way to acquire a very special, first edition map of the aquatic labyrinth that is known locally as the "Mharan Waterway", exclusively for Breeze subscribers. The cave system is so named because it is heavily suspected to form part of the passages leading to the forgotten realm of the Mhara. If this is so, precious few people would know (with that group including, no doubt, our dearly departed Mayor Palmer, who in life enjoyed a privileged relationship with the Mhara). The waterway is also thought to be frequented by the absent King of Mirith, a noted fanatic of Mharan culture. We have not yet received full word on the exact manner and number of creatures that reside within, but we do have some rather pertinent information on the cave's accessibility. All of the portals and exits are one-way only. To demonstrate, you cannot hope to reach the cave by portalling from Brigobaen, nor can you enter by diving under the seas of Lerilin. If into the cave you wish to explore, then to Marali you must go. There, in a vacant, sand-filled house, lies a hidden portal. The item demanded by the portal is a tiny sea shell: a rather delicate item which has been forbidden by the authorities of Brigobaen, who hope to preserve Mharan security. Brigobaen's indignation on the subject dates back to the year four-hundred and thirty-nine, when the artificer Arathis (formerly a member of the Division of Diabolical Devices) used the waterway to carry out an attack on the Mhara. The Lerilin Breeze makes no official comment on this matter, of course, nor do we recommend that our readers visit the larger warehouse in Morganstown and inquire within about these wondrous shells. To do such an unspeakable act would be completely irresponsible, and if word of it were to ever spread, then one would surely bring down upon themselves the righteous anger of the holy temple. My friend is in love with a brigand. I told her it was a bad idea, but he is so strong, and smells so nice, and smiles in a way that makes her heart melt, and I just can’t take convince her to forget him. What should she do? And do you have any advice on what to cook, in case she has already invited him for supper? Do you think he will enjoy chocolate for dessert? Nothing can ever go wrong with chocolate, unless it makes him sneeze. In that case, I am sending you the recipe of my apple crumble pie with a hint of lotus and mandrake. If I were you, I mean, your friend, I would have both ready in advance. My Geofric is very easy to please, but his dogs are a different story. Nyatha Bark prefers savoury desserts, for example, like salted ale cookies. I can send you the recipe for those as well. Does the brigand have a puppy? Do you? If not, you may want to find one yourself. It is great to break the ice! You both sit next to each other, petting your four-legged friend, and hop! All of a sudden, you are holding hands! Just don’t follow him to one of those shelters - they are awfully unclean! Peel and slice four apples. Cook them with the petals of two lotus flowers, and one piece of mandrake root. Meanwhile, make the crumble with flour and sheep’s butter. Discard the lotus and the mandrake. Pour the apples into a kettle (like the ones in brigands camps, so that he’ll feel at home). Slice as if it were a pie. Call it “pie”. Brigands like pies and you don’t want him to be suspicious of your dessert. In a bowl, mix a bit of salted water, half pint of ale, and some flour. Mould the cookies in the shape of little bones. Come on down to Unundir the Spectacular's Reagent Shop today, and treat yourself to the enjoyable and engagin' experience of hearin' a master storyteller at work! Bring the whole family over fer a meanin'ful and fun-filled time that is sure to delight. Why choose Unundir? I'm glad you asked! We're Family Friendly, fer children and adults of all ages. We've got an Open Door Policy: drop in with anyone, anytime! And of course—we've got Educational and Inspirational Storytellin', from a true Raconteur whose deeds are unmatched and unrivaled, with not a fib to be found in even a single one of his tales! No additional purchase or voucher or anything required—so hurry on up. En'ertainment is awaitin'! We have but one more special note for you all: The Lerilin Breeze is still looking for more assistance! Reporters are always welcome, but if journalism is not your forte, worry not! We are open to partnering with any columnists, artists, reviewers and anyone else similarly occupied. Applicants need only be passionate about Lerilin and our community values. Any inquiries should be made directly to Sulovir. Help make the Breeze an even more refreshing and enriching experience—apply today! And that concludes our offerings for you in this issue. So until next time, dear reader: farewell, profit, and take heart—particularly as that oh-so-terrible blood-red hue returns to the night sky! The library was the best place for breakfast. Ever since her move to Mirith, the wizard cultivated the habit of reading the morning reports with her drink of choice. It was just the apple that she ate a bit later, outside, not to stain the pages. The library subscribed to all the cities’ press, from the New Lerilin Gazette to the Red City News. That day there was a new issue of the Lerilin Breeze. “Exactly what we needed!” she told them, trying to placate their early ire. With the copy of the paper under her arm (“borrowing” from the library being an habit allowed to the people in the service of the King), Cassandra made her way to the Vanguard’s hall, wondering what could be the origins of such document. The bloody bleeding moon hath come and gone, and with it, the annual fears of stepping beyond the stalwart walls of the quaint fishing village. Now as usual, there was quite a bit of trouble at the docks and cemetery, but these seasonal troubles are not new by any means, and are almost not worth mentioning. Things could have certainly gone a lot worse... and for all the other towns and cities to the north, things did get a lot worse. From Marali to Mirith, Gohoran to Duldrus: all of them faced a host of threats and unique challenges this last moon (and we will touch on them all below, of course). But when we adopt this outsider perspective, us Leriliners truly have a lot to be thankful for this year. The tides of fortune have not always been so kind. This is made especially apparent by the latest news from Marali. As we go to press, we have just received word that the Remote City has been besieged by a massive army of ants, unparalleled in size and strength. We will surely be hearing more of this soon, from both our embedded reporters and the Myrmecologist Society of Lerilin. We are bound to have much to report next moon—but until then, all we can do is send our best thoughts and prayers to all those affected in the north. May there be at least a modicum of relief with the softer and warmer hues of the coming Red Moon. But now, it is time for us to say: breathe in deep, and take in the invigorating air of The Lerilin Breeze! An unusually large infestation of rats wreaked havoc on the docks quite early this moon, not long after our last issue went to press. The circumstances remain unclear, as it was far too early for the incident to have been caused by the magics of the full moon. One theory being shuffled by our analysts is that the rats were attracted by an unusually smoky batch of dried trout which seemed to be emanating from Tanaka's House of Sushi. Alternatively, the rats may have simply become more emboldened and aggressive with the increasingly warm summer temperatures. In any case, the infestation was eliminated before any manner of disease could be spread. To provide some context and further commentary: giants rats have long thrived in Lerilin's moderate climes, with our warm summers and relatively mild winters, and news of infestations are nothing out of the ordinary. But in recent years, the rat colonies have been thrown on the defensive with the rapid increase in the town's feline population, and infestations are becoming more and more infrequent. If the rodents continue to lose out in this ongoing war, then our quiet fishing village might just get a little quieter! In other news: whilst conducting fieldwork at the Roasted Barley, one of our reporters managed to learn that the village was recently visited by a formal delegation from the Mirith Vanguard. The delegation seemed to have had some business with Mr. Fawr, the town banker, but the details are still foggy. We will be sure to provide further updates as we gather them. As for the full moon, it passed largely without incident inside our walls, as the majority of residents wisely postponed any unnecessary travel and stayed within the safety of town limits. The same cannot be said of most of the other cities, unfortunately. The City of Marali in particular experienced a host of problems, ranging from trouble with forest dragons inside the faraway tree maze, to insurrections of bone mages and even wraiths—yes, wraiths—inside their local cemeteries. Then there was Duldrus, where a band of local hunters was attacked by a sizable crew of pirates. The effects of the Bleeding Moon were felt strongly in Gohoran, too. There, fiery, blood-hued creatures attacked in unusually large concentrations. Similar incidents were reported not far from there, at the Medius Island. These two incidents are believed to be connected, as even though they occurred at separate times and places, witnesses reported finding a cache of small moon fragments at both sites. It is also believed that these fragments were being used to summon the unnatural beasts, by way of some unknown magical mechanism. This theory, while quite strange, is not entirely unfounded, as a connection between small moon fragments and the mysterious Void Realm has already been proven by the Arcane Research Development Enchanting and Tinkering Group, or A.R.D.E.N.T.. Their experiments in the earlier part of the current decade are now widely known to have employed a copious amount of moon fragments (and that same research is also widely criticized for having caused a number of vicious creature attacks). But in spite of A.R.D.E.N.T. 's experimentation, the nature of the Void Realm is still not very well understood, and we can only speculate when it comes to any connections that it might have with the reported incidents. The abnormalities in Gohoran and Medius are liable to remind some of our readers of the fires that broke out last moon, which were described in the previous digest. Unfortunately, no further leads have been uncovered on that front, and the machinations of Black Hand druid Fyod remain a mystery. But as always, we stand with our eyes, ears, and pens at the ready! A portrait of business magnate Lance Waltham. Now then, on to the sensational subject of the Sheep Slayer. This moon, we had the wonderful opportunity to have a sit-down with Lance Waltham, the Andrisian business magnate of Waltham's World of Wool, and the man at the centre of the ongoing controversy. Many of our readers have been intrigued by the details of the shocking case, and are quite naturally curious for more—and so we are proud to present this one-of-a-kind interview, reproduced here in its entirety (with all due credit to our expert stenographers). We thought it best to leave you to your own interpretations this time around, so without further ado: the transcript! Sulovir: First off, good morning, and thank you! I'm really excited to be able to sit down and have this chat, and our readers at the Breeze are dying to get to know the real Lance Waltham a little bit better. I was wondering if I could start off by asking you a question about your background. What was your first job like—have you always been in the wool business? Mr. Waltham: I was born in the wool business. My parents were wool merchants and passed me their small shop. I have turned it into an empire and put our name out in the world. Now we are the main reference for anyone interested in fashion. I have a robe that would suit you very well, by the way. We can try it later, if you wish. It is only 10 gp to try it on. My first job was to count the golden pieces for my father, behind the counter. It formed my character and gave me the necessary skills to deal with money. The rule of thumb is “always add, never take”. If, by the end of any given day, you haven’t doubled your fortune, you are doing something wrong. S: And what a clear difference that has made for the business. On that note, what is your vision for Waltham's World of Wool, five years from today? W: I am working to expand my tailor shops right now. I want to buy the existing ones in Mirith, Andris, and Lerilin, and convert other establishments that now serve useless purposes, like Jorda’s potion shop in Morganstown or the Ferrite Lounge in Duldrus. In five years, I see us with several shops, dealing directly with our clients. Maybe even in Gast, Welif, Foehan. There’s this new man from Gohoran staying in Andris, he may be a good contact to help a shop there. He doesn’t seem very talented for business, though, so I may as well just buy his shop. S: Clearly some exciting times ahead then! But moving back to current events: what can you tell us about the incidents with the two Sheep Slayers—tell us what was it like to discover the tragic fate that had befallen your flocks, not once but two times! W: Murderers! Wizards! Criminals! I want them to pay for what they have done to me and to my business. They tried to poison me! Haha! What they don’t know is that I don’t eat sheep’s meat. I’m a vegetarian. Ha! Fooled them! But I demand a compensation. I have orders to fill. I have been obliged to collect zombie shirts. Fortunately, there is a market for cemetery fashion amongst the youth, otherwise, they would have ruined me, those bandits! S: What can you say about their identities? W: I don’t care about their names, miserable ruffians. Hmmpf. Lousy gangsters. Despicable vandals. Bunch of hoodlums. There you have it, their identities. That’s who they are. Lice-ridden delinquents! S: And how do you intend to pursue justice? W: I want them to pay for what they’ve done. I hear there was someone willing to reveal their names here in Andris, but I missed the encounter. Senator Grantham told me she has been dealing with the matter and asked me to wait. I have been waiting for long enough. I will take this in my hands. S: Is there anything else you would like to add? W: Yes, I have the perfect pants for you, over there. For 20gp you could try them on, they would really suit you. S: Yes, they look lovely, I'd be glad to take a peek later—but first, as you are no doubt aware, a few reporters have made some accusations regarding the guards you employ to protect your flocks, with some reports claiming that you hired law-breaking brigands, and one report even claiming that you hired forest dracos. S: Well, could you help shed some light on the controversy? W: Look, it’s sheep. Innocent sheep attract all sorts of greedy foes: dracos, bears, lions, wolves, brigands, hounds, reporters, harpies… That is why I take the trouble to hire shepherds, don’t you think?! I used to work with people found by Rodrick, in Mirith, but those thugs wanted a pay raise. Thieves! Opportunists! Now I have Dodd from the stable here, and he’s an honest lad. S: Great, thank you for clearing that up. Now then! Before we conclude, I'd like to ask just one more tiny question, out of simple curiosity. To what charities, causes, or civic organizations have you donated more than 500 gold pieces over the past year? W: I consider that it is the duty of magnates like me to support good causes and investments for our city. Every year, I donate a large amount of my profit, in order to get a tax reduction. I donate mostly to Waltham's World of Wool, to help them develop their business in the conditions of peace and prosperity that we all seek for Andris. I have also made a large donation to Anthea’s group of pixies’ studies last year - they needed a table and I gave her the necessary logs. Two or three, I don’t remember now. In the past, I have donated the shirts for the campaign of candidate Weyckel. They cost him only 50 gp each. S: Great, great. Well I shan't trouble you any further—thank you so much for your time, Mr. Waltham! I hope my letter finds your well. I am writing because I have a huge problem! A nice lady of my acquaintance invited me for dinner. I want to say yes, but the issue is that I am growing a bald patch on the back of my head, and I am ashamed she will notice. Normally, you don’t see it because I wear my helmet, but I was told that it was required to remove head gear at the table. I would ask my colleagues for advice but, you see, they are not exactly the kind that worries about grooming… I would even dare to say they would be shocked if they knew I can write. I count on your discretion and hope you can help me! First of all, you should really try to convince your colleagues that grooming and personal hygiene are very good habits, that will bring them many opportunities in the fields of love and work. If you wish, I can do a small workshop for them, to teach them basic presentation skills. Let me know if they can come to Lerilin! As for your balding patch… This is your lucky day! I was just reading some of my old recipes on hair products. As you must know, I have a strong preference for things with several uses, especially if they can be eaten as well. If it’s good for your tummy, it’s good for you, right? I have two suggestions, depending on how long you have. If you still have a few days, then I would start with the first recipe below. It’s a paste for you to apply it directly in your patch, and rinse in the morning. You can make a big bowl of it, since you will need to repeat the action for six nights. The good thing is that it is also an excellent sauce to eat with your steak or trout. The second recipe is for emergencies. Say, the dinner is tomorrow. Then, my friend, we need a quick fix, I’m afraid. So I’m giving you the recipe of a completely edible wig, very easy to do with strings of flour. In this case, you may want to add some perfume to the mixture, so that you don’t smell like a cookie. In a bowl, mix a pint of Lerilin creme ale, two crushed garlic cloves and a red egg. Soak three oatmeal cakes in the mixture, to make a paste. Spread directly in the affected area, or heat at a low temperature, stirring frequently, to make a delicious steak sauce. You will need two bags of flour, three eggs (choose the colour closest to your remaining hair), a grated mandrake root, and a few drops of perfume (only a few, since you may want to eat this for breakfast). Whisk together the flour and the mandrake with a fork. Create a deep well in the middle of the flour and add the eggs and the perfume, whisking gently. Cover it with a piece of cloth and go to the tavern for an hour. When you come back, stretch the dough on a flat surface. With your dagger, katana, cooking sword, or whichever tool you prefer, cut long strips of dough. Tie a soft bow of cloth around the strings, roughly in the middle, and put your new wig on top of your head. Adjust the length of the strips according to the length of your remaining hair. Remove the wig and boil it in hot water. That will prevent the dough from stretching any further. In the morning, pluck your new flour hairs directly from the wig. Breakfast in bed! Domain of Arcana is pleased to present: Rylyan's highest-quality, premium grade, Zem Stormbrow-approved ginseng. The clerics of Brigobaen find it indispensable for their healing spells and salves—while everyone else finds it indispensable for all their home brewing needs. Rylyan Ginseng is world-renowned for its ability to produce a bright and satisfying cup with rustic earthiness and eye-opening depth. Why, might you ask, is our crop so unmatched in its splendor and consistency? Well-defined seasons and rich volcanic soils produce the gold-standard roots, and our masterful growers take care of the rest, ensuring that the crop is harvested at the peak of ripeness and delivered fresh. Don't waste your time on poor quality: switch to our premium ginseng today, and you'll lose your cravings for anything else. And to top it all off, we have a special offer for all Lerilin Breeze subscribers. Come and show this advertisement to Rylyan, and receive a 10% discount on any brewing paraphernalia when you make a ginseng purchase of a three hundred-root bag or larger (offer limited to one use per subscriber). Now then, we would like to close this moon's issue with a simple request for aid. In the many mysteries and conflicts taking place in the world today, there is only so much concrete information available—the story must always be filled in with reasonable speculation and educated guess. And so if at any point, dear reader, you become aware of any helpful details that we may have missed, or any erroneous assertions, then please contact us with all due haste! We will gladly credit any contributions, and are more than happy to accept anonymous tips as well. But until next time, dear reader: grant no place to fear, put vanity to flight, and continue to see the truth in undimmed light! Here in the fishing village, it's been an odd moon for weather patterns. We refer, of course, to that rather large and unseasonal storm system at the turn of the Bleeding Moon, which blanketed everywhere from here to Marali with a downpour of rain, disrupting trade routes, damaging crops—truly a meteorological event to remember for years to come! And that's before we even begin to take into account those reports which verify rumors so outlandish, that we dared not even print them last time: raindrops as red as the moon, as warm as a fire crystal, and as real as the page you hold before you. What could it all mean? At this early juncture, we cannot promise any answers, but what we can promise you, is a thorough exploration of all the relevant facts, and a thoughtful synthesis of all the relevant opinions. So let us not dally any longer: breathe in deep, and take in the invigorating air of The Lerilin Breeze! To begin, we find it most prudent to revisit the events in Marali on the two hundred and forty-fifth day of the Bleeding Moon, year of Elara four hundred and forty-nine. Some manner of controversy has ignited over our telling of the ant-related event in the last issue, and in particular, over the language used to describe the outbreak of violence. What we described as "defending against an invasion", others insisted was a "massacre". Truthfully, we regret the harm we caused by failing to take into account the opposing views, and thus we regret falling short on our quest for higher journalism. But this same quest also demands that we ask ourselves a question: can we truly say that either side is without merit? We have made our opinions known. This debate is one where emotions run high, and for that reason, we have decided it best to extend an editorial platform to two individuals, one from each side of the floor. We made our selections based on who we felt would be most representative of the opposing schools of thought, and you may see the results in the "Opinion" section. We must confess: we are quite proud with what we have to offer! A depiction of the events in Marali. But putting myrmecology aside: all across the lands, the people of Oberin were swept up with mystery and wonder at something else entirely this last moon: meteorology. We look back at the anomalies of the passing summer and find ourselves at a loss for words. The three moons of autumn await, and it is with great discomfort, uncertainty and trepidation that we enter into the new season. What could have possibly caused the heavens to unleash red fury on our unsuspecting communities? Can we expect the red rains to return anytime soon, if at all? Rest assured, dear readers, that while we may not have a single sufficient answer, we will be singularly devoted to learning and researching more. For there is one, rather important question that many might not think to ask: has this happened before? If so, discovering such knowledge would be instrumental in preparing for the future. But as it stands, only time will tell. On the other hand, we have also received numerous reports pointing to an increase in moon fragment findings. The possibility that this phenomenon might be linked to the freak weather events is of course another line of enquiry for us, and we hope to uncover more soon. To review what was covered in the previous issue, the turn of the moon saw a series of incidents in which moon fragments were being used to power a variety of arcane summoning rituals. Witnesses painted stark pictures of fearsome beasts crawling out of improvised portals, consisting entirely of small moon fragments placed in very careful and, indeed, artistic arrangements. In recent days however, these disturbances have given way to a veritable moonshower of fragments, seemingly falling at random, but in quantities so great that we simply cannot dismiss it as happenstance. What significance this development might have for the future, we cannot say—other than the positive effect it will have on your coin purses, of course. And as for that: given the unusual circumstances, we feel obligated to remind you, dear reader, to be discriminating in your trade dealings, and to only sell to reputable buyers, so as not to let these powerful fragments fall into the wrong hands. Your safety may well depend on it! To touch upon other world affairs: it was a bad moon for the Marali Guardforce, after a journal containing highly detailed and sensitive information on every member of the force was found in the possession of brigands. These brigands had been traveling through the catacombs before succumbing to the evil forces teeming within. Further investigations failed to turn up any more evidence as to who they were working for or what they were planning. And on the other side of the world, Andris continues its deliberations behind closed doors on what has turned out to be a host of issues exacerbated by the ongoing Sheep Slayer controversy. We must admit that we are more than a little bit curious to see how junior senator Jan Varouf's attempts to deliver on campaign promises will come into play, especially the promise regarding the regulation of merchants' taxes. It could very well grow into a heated affair, with the unions and syndicates being pitted against the businessmen and industries. Lastly, the political situation in the Royal City seems to be remaining in its delicate state of balance. And on that note, some of you may remember how in the last issue we mentioned the surprise visit from the Mirith Vanguard. We sought out the man who entertained the delegation, bank manager Mr. Ellis Fawr, hoping to inquire about the purpose and political implications of their meeting. Mr. Fawr unfortunately could be not be reached for comment, but it stands to reason that the search for the missing king was one of the subjects of conversation. The Myrmecology Society thank you for your interest, and for the opportunity to publish in your newspaper more information on our magnificent ants. We hope that, besides clarifying some misunderstandings (certainly to be attributed to ignorance), we shall interest new students of our noble science. We were informed that we should take into account that Maralians are a tough people, but not necessary the best educated. Judging from the size of the head of a famous Captain, we can accept this handicap and do our best to overcome the obstacles it poses. Therefore, I have asked my 5 year-old boy to make a drawing of the nuptial flight. If a child can be amazed at such a wonderful sight, maybe his innocent eyes will be better witnesses of what we have been trying to express. Perhaps that innocence will produce clearer imagines, of a level of complexity easier to grasp by the Maralian military. Even great scholars of old have recorded error-inducing observations of our beloved insects, in what regards, for example, famously miscounting the number of legs. How could an uneducated Maralian do any better? Perhaps, if we point out the heart-shaped body of our ants, they will finally see that they are creatures of love, not hate. So we hope to explain a few things that we consider our general public deserves to know. a) Ant nuptial flights take place in hot seasons. Maralian climate has never been especially sought by our lovely creatures. Recently, however, we have observed some changes in the norm, with the North becoming warmer and warmer. Of course, we encourage this change and hope it continues in this good direction, since it provides a larger choice for our ants to build their palaces. b) Ants have queens and princesses. Up to the nuptial flight, an ant princess resembles a pixie. That is probably why pixies are so welcoming and have such a great time at ant weddings. Usually they leave before the wings of the new queen are shed — otherwise, it breaks their little pixie hearts. c) In order for the wedding to take place peacefully, hundreds of ants sacrifice their lives to keep their enemies at bay, be it harpies, trolls, rangers, or any other beast of prey. That’s called “predator saturation” and is a sad but necessary strategy to guarantee the success of the ceremony. Finally, we would like to go back to point a) and make an appeal to fight for Marali climate change. Let us make Marali a warmer place! It has come to my attention that I am the sole member of the Marali Vanguard to witness this incident you speak of, and as such, I am forced by circumstance to give some sort of statement. Before I do so, however, please note that my testimony is my own and does not necessarily represent the views or facts according to Marali itself or Commander McTyr. That being said, please feel free to use my name in your article--I have a certain level of disdain for those who would hide beneath the cloak of anonymity, as they rarely have good intentions beneath their masks. I received word from Octar that he had sighted two Forager Ants, and the Guards noticed there were more near Marali's gates. Such an incursion of insects would be an issue in any of Marali's territories, but since they were directly impeding the flow of adventurers, travelers, and soldiers to and from Marali, it was extremely important that they were removed. We cannot allow our border to become unsecured due to infestations of any creature, much less several dozen Ants gnawing at the legs of those loyal to and interested in Marali. The wizards Ryen and Fuoco were joined by myself after Octar's Captain duties called him away, and we removed most inhabitants from a tunnel before discovering they had managed to burrow through our rock formation. Think of the disgust and anger the miner's unions will express at the damage done to one of the reliable mainstays of their industry! Marali simply could not allow this! Unfortunately, during that time, the creatures managed to more directly threaten Marali in a manner I am not at liberty to elaborate upon. Please note that when the lives of innocent civilians--those who would normally flee at the first whiff of a half dozen Forager Ants--are at risk, the usual rules of fairness and honor are discarded from my personal playbook. We removed all of the Ants, including injured stragglers. Later on, after dying to a larger Ant's envenomed bite, Ryen swore vengeance upon all of Ant-kind and instituted a more permanent solution to the reoccurring infestation problem--one so [there are dribbles of ink here, suggesting several false starts to the next word] drastic that McTyr himself seemed hesitant to condone such extreme measures. Rest assured, however, the Ants are no longer in any position to menace those passing through Marali's gates. Your readers must understand that unprovoked attacks on Marali's unarmed citizenry will not be tolerated, as was the case with these Ants. I am happy to answer any further questions you have, and I hope my transparency provides a helpful contrast to the elitist remarks from the Myrmecologists. Thank you for your time. My dear Marigold, how are you? I am in great need of your help. You know my boy, that lovely and quiet little soul, who used to bring me every morning a renewed joy to be alive. Well, as it happens, he is growing up, and I fear his current friends are not the best company. Every evening, just before the Lady Moon takes over the skies, they gather at the cemetery, wearing zombie shirts and black boots, and singing mournful songs that we only hear at funerals. Often the refrain goes “oooOOOoooOOOooo”, just like the spectres! Can you imagine? It’s heartbreaking. They look so sad and somber. He even died his hair black and won’t let me comb it away from his eyes! I don’t know what to do, my Marigold! I just want my old boy back! My ray of sunshine! My dear Kaoveth, tsk tsk! I’ve always thought that making zombie brain stew was not a good idea. All the diseases! And all those bad thoughts coming from that grey jelly directly into our own! Of course it puts gloomy ideas into your child’s head! So, first of all, I would suggest that you stop making your stew. I understand it’s a staple of your restaurant, so I offer below a new recipe to take its place: a bone mage pink fizzy cocktail! The one disadvantage is that you may have to import the bone mage staves for decoration, but it will be well worth it. As for your boy… I understand that you want him back under your wing. The best strategy may be that you go out of your way to meet him, and lure him back with something that fulfils his needs too. With my kids, one thing I do very often is to adapt cookie recipes to their ages and ask them for help. For example, at four years old, we all cut little bears. At six, we cut letters of the alphabet, since they start reading. And so on! Why don’t you invite your son to an afternoon of baking? He can entertain himself making the cutters in the shape of a skull! You’ll both make a batch of terrific cookies, and he can invite his friends over for tea. Also, he is probably in the age where he starts being interested in ginseng. Why don’t you add it to the batter? It’s better for his health than smoking, that is sure. Maybe let them try the cocktail too, and there you go! You’ll have a bunch of teenagers hanging out at your restaurant rather than the cemetery! In a jug, mix some Andrisian champagne, a dash of Port Gast moonshine, and some petals of lotus flowers, just enough to make it look pink, through the glass. Add a red egg if desired, for colour and consistency. Rim each glass with sugar and a hint of salt. Pour the cocktail, taking special care to allow at least two lotus petals in each glass. Decorate with a slice of apple and a bone mage stave. For the cutters: to make the cardboard malleable, soak it with a bit of sheep’s milk. Shape it into the desired form, in this case, a skull. For the dough: use any regular cookie recipe (you can consult previous numbers of the Breeze to find my recipes of choice). Chop some ginseng very finely, and incorporate it in the dough. Let your child cut the cookies into the right shape and bake. If you want, you can take the cookies to a next level of sweetness by filling the eyes and the mouth holes with melted chocolate. Make sure you have some cushions around, so that the kids can chill out after tea! If there be any among you desiring a functional and fashionable garment whose fit is well and truly correct, then let them come to Paralia's House of Style on the north end, and they shall have it good cheap. Now offering a special Harvest Moon bargain: two pairs of grey wool trousers, for the price of one. Try something on at no additional cost. Full reimbursement guarantee. If it isn't Paralia's, it isn't Lerilin! All of us here at the Lerilin Breeze would simply like to extend our genuine thanks to all our readers and writers alike for their continued support in making our publication a joy to produce. We look earnestly ahead to the next moon! But before we take our leave, we have just one final request! (as we so often tend to). We have already demonstrated to you our determination in our ongoing quest of self-improvement. But we cannot do it without your help! If ever you see something you really don't like – or something you do! – then we would be incredibly grateful if you would do us the honor of letting us know. So until next time, dear readers, look boldly forward to the dawn, and take solace in the promise of the breaking day! The smell of the crisp ocean air, the rustling of the wind in the trees, the autumnal array of leaves drifting by the window—all signs of another peaceful Harvest Moon here in the village by the sea. So pull up a chair by the fire, breathe in deep—lovely, is it not?—and take in the invigorating air of The Lerilin Breeze! As pleasant as this time of year always is... a lovely Harvest Moon it was not for all the hunters and gatherers who found themselves at the mercy of yet another terrible storm system. Roughly eighty days of severe weather were recorded, with almost all of them occurring in the early phases of the moon. We are sure you are wondering: might this storming be connected in any way to the rains of the Red Moon? That is our main question at present, and there will surely be time to come back to it at a later date. But for the time being, we can only be sure of three things. Firstly: these storms—while serious—lacked the otherworldly red glow that plagued our skies last moon. Secondly: small pieces of the moon continued to fall in quantities hitherto unheard of. And lastly (and most importantly): so great was the threat of the winds and rains, that loss of life and limb was all but certain for those who wandered carelessly into its midst. And afterward, even once conditions had stabilized, the storm's effects could be felt for days. Lerilin's forests saw an increase in pixie sightings, while our sources in Mirith reported excessive bracken growths in broad swathes of territory—all of which resulted in further complications for travel. As for Marali: sadly, the team we sent there failed to return. And so continues the Great Storm of 449. Are there any other conclusions to be drawn? Undoubtedly so, but for now, we must leave them to you...with one final caveat. Keep a watchful eye on the skies! 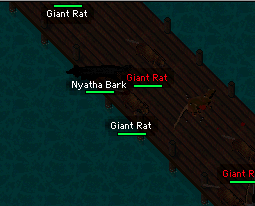 Nyatha Bark took the storm in stride, doing her part to keep the docks free of rodents and their diseases. Unfortunately, the bad news was not nearly over with the dissipating of the storm clouds. For under the light of the full moon, word reached us all the way from Marali that three local miners had been found dead on the job. Details of the incident are few and far between, but we have managed to piece some clues together—being committed as we are to protecting workers' rights, both at home and abroad. Of these clues, one of the most noteworthy is the fact that the miners' bodies were found in the very same spot where a supercolony of ants had attempted to build a palace in recent moons (please refer to the previous two issues of the Breeze for reference). We thus have reason to believe that there must be some significance to this plot of land—but what that is, we cannot say. Other reports called attention to the tools found on site, ranging in value from the common amber axe to the legendary centaur axe. We must also not overlook the timing: why the full moon? Was someone perhaps driving them to increase their harvesting output, in unsafe conditions? Whatever the cause, we are determined to get to the bottom of this tragedy, and return with an update posthaste! The other thing we love about Harvest Moon? The first of the year's biannual trivia segment, of course. Our trivia challenges your knowledge of both past and present, lofty and mundane! How many can you get right? Compete with your friends, family and neighbors for additional fun! According to town greeter Duvalle, which foreign dignitary might you expect to find at the pub? Which valuable ring can sometimes be found in the Ant Hill? What is the name of the guild whose hall once existed at the crossroads of the Volcano Road and Hermit Path? What is the name of the Mharan princess who once rescued the late Mayor Palmer from a terrible storm at sea? "Emergence from Haven", a historical essay written by Cecil of Brigobaen, describes how Elara led humanity out of hiding after the Black Plague. Where is 'Haven'? Who is the predecessor of bank manager Mr. Ellis Fawr? These three events happened at around the same time—guess the year! Lerilin is attacked by the Blood Cult. Brigobaen is attacked by Marthonis. Mirith creates two copies of the Pure Crystal Machine, sending them to Marali and Andris—and leaving Lerilin emptyhanded. Lerilin is to Creme Ale as Foehan is to __________. Which types of seafood are commonly used to prepare chirashizushi? Eleven years ago, the Great Storm of '38 pummeled another city. Which was it? In the recent Growing Moon, a Black Hand stockade was found dangerously close to Lerilin. Investigators surmised that it was being used as a depot for the transportation of something important. What was being transported, and to whom? What does A.R.D.E.N.T. stand for? What is the only establishment that sells Turtle Shells? Which foreign breed of canine has stolen the hearts of Leriliners everywhere? And last but not least: who is the best baker in town? X’annas the Exterminator: When pests are on the rise again, do not despair—X’annas the expert exterminator is at your beck and call! His exceptional track record has won him the approval of merchants and townsfolk far and wide. Watch with admiration as he executes rats and pixies; smile with glee while he extinguishes ants and snails. If you have a pest problem, the time has come for you to reclaim your fate. Simply remember: there exists no threat too extreme for X'annas! And thus concludes our Harvest Moon publication—we do very much hope you've enjoyed your read. But before we go... the promised trivia answers! So finally: be at peace as the nascent Dancing Moon begins its dazzling movement across the night sky, and we will await your return on the other side! The dancing days have come and gone...and they did not disappoint! A good deal of news awaits you this moon, so we dare not dally. So set right down with a nice hot cup of ginseng and a niblet of your pastry of choice, and as always: breathe in deep, and take in the invigorating air of The Lerilin Breeze! We will begin straightaway by addressing the perennial question – a question which has been on every Leriliner's mind for almost eight years now, and which has seen renewed interest in recent days. When, the people wonder, will someone manage to take up the long-vacant mantle of mayor, and thus bring Lerilin's long period of interregnum finally to an end? And the equally important follow-up: who will be the one to do it? On the first question, we cannot be certain. Some residents are in no hurry to make any drastic changes, and rightfully so, given the recent years of history. It is well known that the assassination of four hundred and forty-one was a terrible tragedy for Lerilin and for the world, yes. But we must also look deeper, and notice the troubles wrought by the tragedy in the realm of business and commerce. It was two long years that our village weathered a wretched period of economic hardship and distress. Many businesses faced the threat of closure—most famously the Bank of Lerilin, which became covered with cobwebs and dust, and which came within inches of failing in year four hundred and forty-three. The scare, of course, subsided. But even now—even though businesses have long since stabilized and have actually begun to post gains in recent moons—even now, the memory of the recession remains. But while the subject of the bank is fresh on our minds, we now find it pertinent to return to the second question—namely, 'who?'. Mr. Ellis Fawr, manager of the Bank of Lerilin, has emerged in the last moon as a potential figure in the contest (if such a brash term can be used). It is true, of course, that Mr. Fawr is a relatively new arrival on the public scene, and that he, by his own words, "hardly knows the place". But should he continue on his present course and gain more familiarity with our people and our ways, then he could very well become a suitable candidate. Another name that has emerged from the whispers is that of local fighter, dog breeder, and family man Geofric. Mr. Geofric boasts over a decade of participation in the Lerilin community and would also make for a fine mayor, but we have it on good authority that he would not be interested in the job, being invested as he is with his countless family responsibilities. And then one citizen (who shall remain nameless) even attempted to gauge the interest of our very own Marigold—she is reported to have laughed at the suggestion! But that is, at present, all the news we have from the political sphere. We are however much better equipped to discuss some exciting news from the Lerilin Library Project*. The project's oversight and management structure was finally set in stone this last moon, with internal elections for Administrator taking place on the ninety-third day. The victor was none other than local druid and bookworm, Ms. Delana Estielle, a decades-long resident of Lerilin. Ms. Estielle brings a wealth of personal experience to the job, in which she will be responsible for ratifying a charter, developing a collection, and ensuring its continual maintenance. Ms. Estielle expects to borrow and learn from the more established libraries of the world, from Brigobaen to Mirith, while still keeping the spotlight on local scholars and researchers. As official partners of the Library Project, we were afforded the opportunity to participate in the election, and take a closer look at other internal affairs. From what we saw, the gathering of funds for the project is still underway, but progressing along at a compelling pace. We expect to learn more details on this soon, once the dust begins to settle on the now-concluded formation and discernment process. But all the same, a steep hill has been successfully climbed by the organization, and now, the main task at hand is for them to secure and/or build an appropriate space for the collection. Multiple alternatives have been discussed and debated—it is clear that this will be no easy feat—but we are confident in Ms. Estielle's abilities to hammer out a solution. *Conceived of in year four hundred and forty-eight by a team of like-minded readers and Breeze staff, the Lerilin Library Project was formed to promote the seeking and sharing of knowledge, philosophy, and truth among the populace of Lerilin, for whom such learning is too inaccessible at present. To this end, they seek to build a library in Lerilin. While the Great Library of Brigobaen cannot be challenged in size and scope, it is an unfortunate fact of life that the road to Brigobaen is neither short nor safe (just think how many have fallen on that journey!). Nor for that the matter do the people behind the Project wish to challenge Brigobaen. As they are quick to explain: the proposed library need not be big, only useful. Even a small collection will make a world of difference, if the volumes are chosen wisely! Libraries and politicians aside, the frenzied energy of the Dancing Moon was not to be found on the festival circuit this year. This is in marked contrast to last year and its Lerilin Dancing Festival—whose organizers have not been seen in some time (perhaps all that rain soured their spirits?). But what was lacking in Lerilin, was made up for on the mainland, with the so-called "Burning Golem Festival" taking place in the Mirithian wilderness. Witnesses described an absurd spectacle of revelry and indulgence, marked with dancing trolls and voodoo, all centered around a conspicuously burning golem. Was it an act of worship? Some darker ritual? The answer lies well beyond our powers of comprehension. But the oldest of our readers might remember hearing this tale once before, when the Dancing Moon waxed full in year four hundred and thirty-eight. Unfortunately, eleven years has done little to increase our understanding. But if nothing else, this long period of time is enough to ensure us that this bizarre festival is ultimately harmless (if infinitely fascinating). We have a special offering for you today, dear readers! We have decided to begin partnering with local hunters and gatherers in direct fashion, offering them a chance to highlight specific trades and offers, with the offices of The Lerilin Breeze acting as facilitator. We have but a single offer today, but we assure you that it is a high-quality one—consisting of a mining surplus acquired during the bountiful Harvest Moon! Five-hundred units of ferrite are available, at a price of two-hundred gold pieces each. Purchase the entire supply and receive a generous 25% discount, for a total of seventy-five-thousand gold pieces – or only 150GP per ferrite! Free delivery within Lerilin village limits. All inquires may be made directly to The Lerilin Breeze. We hope you are thoroughly enjoying our coverage of all things Lerilin (and some things beyond). And if not? Let us know! We also urge any readers to contact us if they are interested in working for the Breeze and/or any of our partners and affiliates, including the Lerilin Library Project. You know where to find us! But until next time: work tirelessly, rest peacefully, and profit abundantly as the verdant green hues of Fortune return to the sky! The final days of autumn have begun to drift away; like the leaves on the trees they fall. Smelling the freshly baked spiced apple pie as you walk down the lane, feeling the crunch of the leaves beneath your feet, and absorbing the warmth of the fireplace as you rest before the hearth—these are just some of the ways we have been enjoying the changing of the season. It is, after all, our most favorite time of the year (though perhaps you already knew that!). So as the winds of blue winter approach, may the Goddess's blessings be upon you all, and as always: breathe in deep, and take in the invigorating air of The Lerilin Breeze! Over the course of the full moon, our office was bombarded with several reports of Lucky Fairy sightings... and we couldn't have been happier! The encounters appear to have spanned a great range of territories, extending from the fair city of Andris, all the way to the rugged backwoods of Marali. Delight and glee filled the faces of townsfolk and city-dwellers far and wide, and it is no surprise why: a cursory glance through the records will verify that this has been one of her busiest years in recent memory. Reported finds include everything from amber axes and eel poles to elixirs and rings of mana—and many things in between! We are sure to receive many more reports of rare and interesting finds as the moon turns blue, and all things considered, the stage appears to be set for a most prosperous Blue Moon Festival! Over at the Royal City, however, the wonders and delights of the Lucky Moon and her patron fairy were overshadowed by an even rarer and more astonishing encounter: a local druid reported seeing the most esteemed of all the grand mages, Seth the Timeless, not far from the city's western gates. His purpose there? We cannot begin to guess, but the visit nonetheless drew a great many sets of eyes. It has been many, many years since the sorcerer has been seen in the public sphere, and one certainly wonders what it must take to draw the elusive creature out of his shell. This time around, it seems that the recent advancements in druidic magery* were enough to do the trick. *We refer, of course, to the summoned familiars popularly known as "Spirit Animals", which came about as a result of Black Hand experimentation, and which have become an essential part of the modern druid's armamentarium. Seth was most curious about the nature of the new spell, and seemed especially impressed by the fact that it didn't rely on the so-called "gates" that power all Black Magic incantations. An artist's depiction of the Lucky Fairy being startled in her natural habitat. Also worth noting, perhaps, is the curious appearance of Seth, who wore nothing but a gray robe and seemed to fade out of sight, as if he were some common spectre, or perhaps even an astral projection. The possibilities, with Seth at least, are endless. As for the significance this encounter might have on the future, we cannot say—but the visit will be sure to have heads talking for quite some time. The only other issue we need touch upon today is that of a wandering sorcerer named Katabasos. Over the course of the past year, reports about this mage's necromantic activities have continued to surface, creating a certain uneasiness in the village air. Most recently, he is reported to have accosted a group of hunters deep within the volcano, offering untold riches and powers to anyone willing to participate in his dark experiments. To be completely fair, it is true that the mage does not seem to pose an immediate threat to our village's safety and security, and what's more, there is a great deal that remains unknown about him. Nevertheless, one must always keep their wits about them, and in any event, we cannot help shake the feeling that there is something dreadfully off about this man, even beyond the obvious. Nay more, we will run the risk of overgeneralization, and remind you that the words of a necromancer should always be taken with a grain of salt... and his bargains not taken at all! This Lucky Moon, we present you with a select few trades from a variety of local hunters and gatherers, for those of you who just cannot wait for the Blue Moon to wax full! As before, all offers may be made directly to any representative of The Lerilin Breeze, by post or in person. Prices listed are the seller's recommendations—room for barter exists, if you can make a fair offer! A bouquet of twelve rare roses, four each of black, purple and blue. Twenty-five thousand gold pieces in all. A set of axes, of coal, amber and frost. Three hundred gold pieces in all. A matching set of the reddest of robes. Twenty thousand gold pieces in all. And our most rare and wonderful feature this year, a ring of lesser mana! One hundred and fifty thousand gold pieces. Before we conclude, we would like to wish the best of luck to all those venturing to Andris for the upcoming festivities, and look forward to perhaps even seeing some of you there. Be sure, dear readers, to stay safe and to stay informed when traveling abroad (and to not lean too heavily on those inconstant tides of Fortune, from whom no one can ever truly be safe)—and then we shall see you right back here once all is said and done! Winter has stepped up in full force, with rains all abound in the moon's waning period—adding to what has already been a remarkably wet year. Still, the timing could not have been more fortunate. Just like you, we hope, we have been enjoying some extended time off to spend with friends and family at home in Lerilin, and at festival in Andris. As such, our usual coverage is relegated to the back-burner out of respect for our time-honored holiday traditions. But as always, keep an eye on the public postings for the latest updates and notices, and look forward to a full recapitulation in our next publication! So without further ado: we hope that it has been a most marvelous Blue Moon for all, and we will see you next at the close of the boldly shining Fighting Moon!